This is the home page for my collection of materials for using original sources in a history of mathematics class. I have used (most of) these materials in class and have had success with them. Much of what students learn in history of mathematics courses and mathematics courses in general is a modernized version of these sources. One can easily say "Fermat and Descartes invented analytic geometry", but it is difficult to recognize modern analytic geometry in the writings of Fermat and Descartes (especially Descartes). Getting from the source to the modern version can provide insight into the past and the present. For prospective secondary mathematics educators, this can also provide insight into the teaching of certain topics. This is in the spirit of Abel's often quoted "It appears to me that if one wants to make progress in mathematics, one should study the masters and not the pupils". This site contains a reading list and a collection of discussion questions and homework problems. I hope you find something that will be useful. Much of the motivation for my creating this site is my participation in the Institute on History of Mathematics and Its Use in Teaching, a National Science Foundation (NSF) supported institute of the Mathematical Association of America. I am grateful for the opportunity that this has provided me. Some of the files here are Adobe portable document files (PDF). You can download a free reader for these files from Adobe. 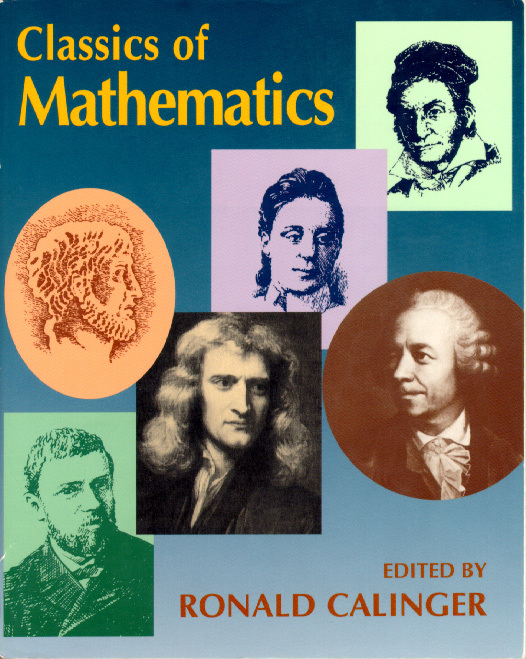 The reading assignments consist of groups of readings from Classics of Mathematics, edited by Ronald Calinger and published by Prentice Hall, 1995. Other source books can be used (David E. Smith's is in an inexpensive Dover edition), but Calinger's book has wonderful introductory chapters discussing the various historical periods. The readings are grouped in a way that makes sense to me at this time 8-), but one could certainly change the order, and add or delete readings. This is perhaps misnamed. These contain questions for discussion in class in addition to homework exercises to be completed outside of class. Turning students loose on many of these readings will lead to confusion. The questions for discussion are meant to lead the class into finding what I want them to find. It also gives the students something to focus on so that they are prepared to participate in class. Some may find some of the questions simplistic, but please keep in mind that students are not used to this type of reading. If someone has suggestions for other discussion questions, I would be happy to add them. Links to the homework assignments are included in the readings. Here are some images of famous works. Links to some images have been included in the reading lists. Vita Mathematica, MAA Notes, Volume 40, edited by Ronald Calinger. Israel Kleiner, "Famous Problems in Mathematics: An Outline of a Course", For the Learning of Mathematics, 1986, vol. 6, no. 1, pp. 31-38. Reinhard Laubenbacher and David Pengelley, "Great Problems of Mathematics: A Course Based on Original Sources", American Mathematical Monthly, 1992, vol. 99, pp. 313-317. Laubenbacher and Pengelley also have a web page devoted to their materials on Teaching with Original Historical Sources in Mathematics. Here you will find a description of how they use the sources, articles, and samples from their latest book, Mathematical Expeditions: Chronicles by the Explorers, a book of annotated original sources for use in teaching. Check it out if you are interested in teaching with original sources!